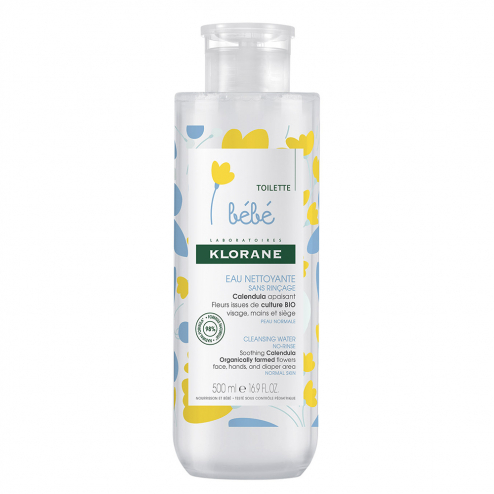 The new Klorane rinse-free cleansing water without paraben is extremely gentle. Rich in soothing and protective Calendula Klorane extract. Enriched with moisturizing agents, prevents skin dryness. Face and seat, apply with a cotton pad until the skin is clean. INCI formula: Water (aqua), glycerin, peg-8, ppg-i-peg-9 lauryl glycolether, coco-glucoside, calendula officinalis flower extract, chlorphenesin, disodium edta, fragrance (fragrance), panthenol, phenoxyethanol, polysorbate 80, propylene glycol, sodium chloride, sodium hydroxide.